The train station is Berchtesgaden. From there you can take the busses to Königssee (line 841 and 842) and Schönau (line 842, 843 and 846). You reach the lake via the motorway A8 Munich-Salzburg and leave at Bad Reichenhall. Then take the B20 to Königssee. The nearest airport is Salzburg (Austria). From here you can take a bus to Schönau. Visit one of the cleanest lakes in Germany - the Königssee. Most parts of the lake are located in the Berchtesgaden National Park. For many visitors this is the most beautiful lake in Germany. With its crystal clear, emerald green water the Königssee creates a unique enchanted fairytale atmosphere. About 17 large electric motor boats from the Bavarian Lakes Shipping drive on the lake. Cross the Königssee with one of the electric motor boats and listen to the amazing mountain echo, when the captain plays the flugelhorn. If you want to drive on your own, it's possible to rent rowboats. Worth visiting is the chapel of St. Bartholomä, which is on your footpath, when walking around the lake. Very exciting to explore is the ice chapel in the rear Eisbachtal at the foot of the Watzman East Wall. From St. Bartholomä leads a path in around one hour to this chapel. These all-season existing snowfield in the Alps extends down to an altitude of 930m. In winter the region is a paradise for cross-country skiers, winter hikers and luge athletes. A journey tip: On the way to the chapel St. Bartholomä you can see a waterfall (Röthbachfall), that falls from the Gotzenalm up in the Königsee. With its 470m height difference it is the highest waterfall in Germany. Things to do close by! Around the region Königssee are many Kneipp facilities. Spa and sauna enthusiasts will find high quality offers with the Watzmann-Spa and the Rupertus-Spa in Bad Reichenhall. If you want to go swimming, you will find many small lakes, open air baths and swimming lakes around the area. Island Christlieger is the only island in the Lake Königssee and is also called "Johannesinsel". On the island, you can see the statue of St. Johannes of Nepomuk. The best way to visit the island is by renting a rowboat. From there, you have a wonderful view on the lake. Fish-World of Experience of Königssee. Look, marvel, feel, taste: Experience the theme of "fish" from completely new and fascinating sites. In this world experience, you can observe more than 50 rare species very closely. Let yourself be surprised!!! Situated high up around Berchtesgaden, this stylish 5-star hotel features an exclusive spa with an outdoor pool. 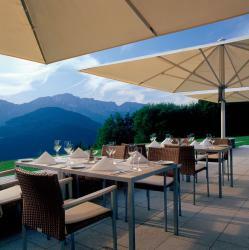 The terrace and rooms offer beautiful views of the Bavarian Alps. 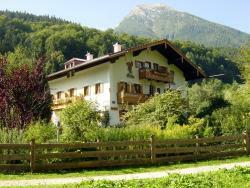 An outdoor pool, a sauna and a garden are offered by these self-catering apartments in Ramsau. Apartments Neuhausenlehen is located directly next to Berchtesgaden National Park and 7 km from the Königssee Lake. This 4-star hotel lies 2 km from Schönau am Königssee and enjoys views of the Alps. It features spacious rooms, a wellness area with indoor and outdoor pools, and free parking.